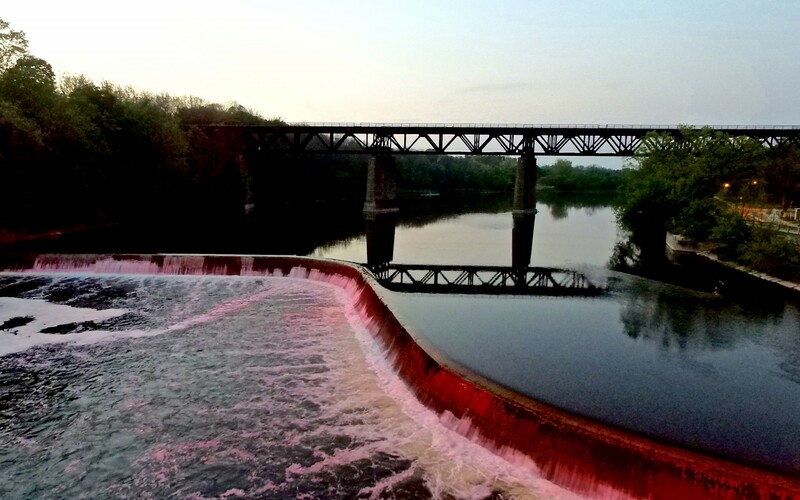 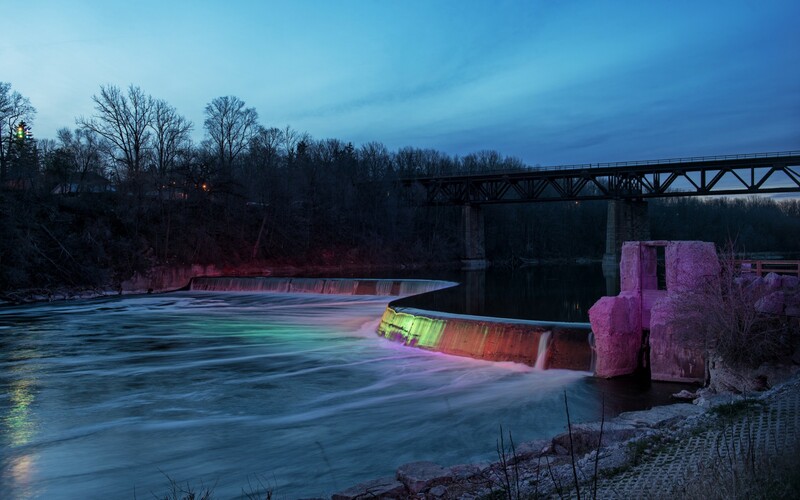 Mulvey & Banani Lighting used RGBW Lumenbeam Grande luminaires to illuminate Penman's Dam in Paris, Ontario - while limiting light trespass. 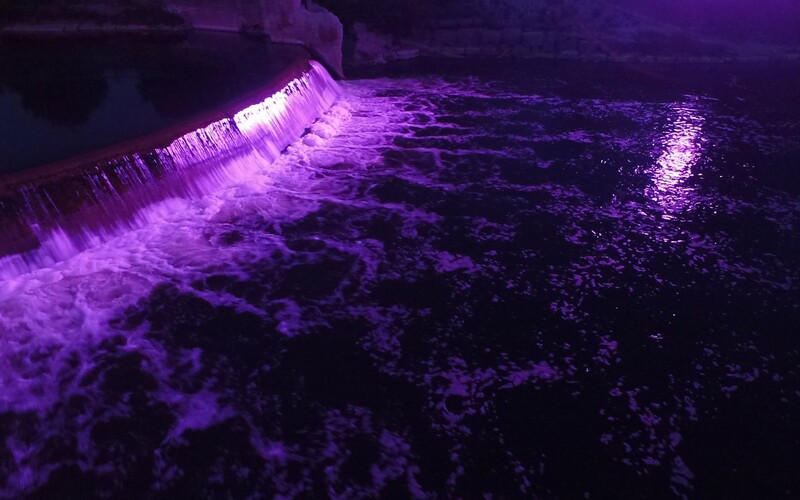 The result is a dynamic lighting design that is visible from local bars and restaurants, adding a fresh face to an attraction that until now was only visible and photographed during the day. 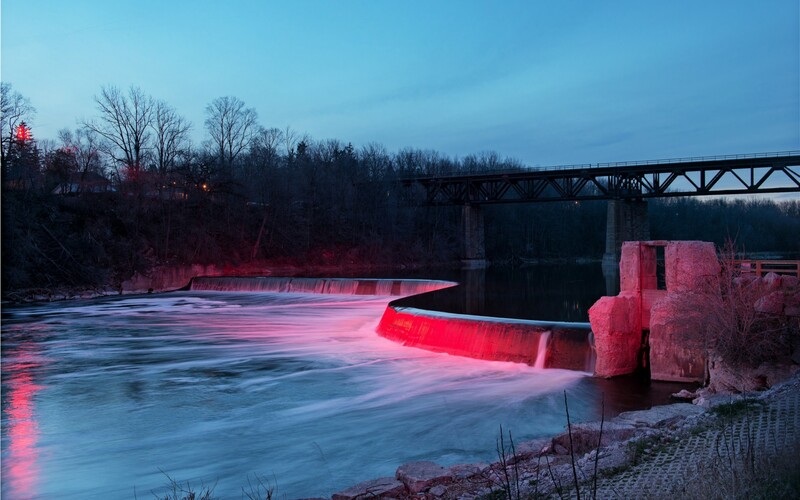 Built in 1918, the Penman's Dam is a landmark in the small tourist town of Paris, Ontario. 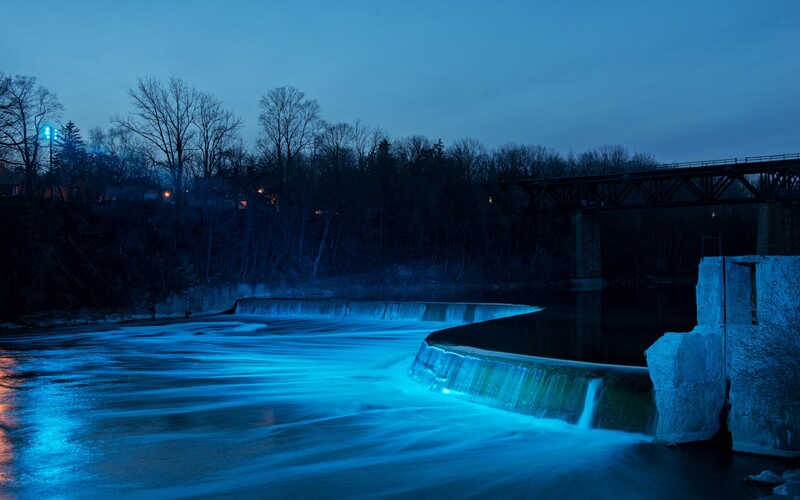 Originally lit with Metal Halide floodlights, the barriered body of water sat in darkness for 40 years after some residents complained about light trespass. To enliven the Dam at night, the County of Brant turned to TPL Lighting, who then reached out to Alan McIntosh, Senior Lighting Designer at Mulvey & Banani Lighting. 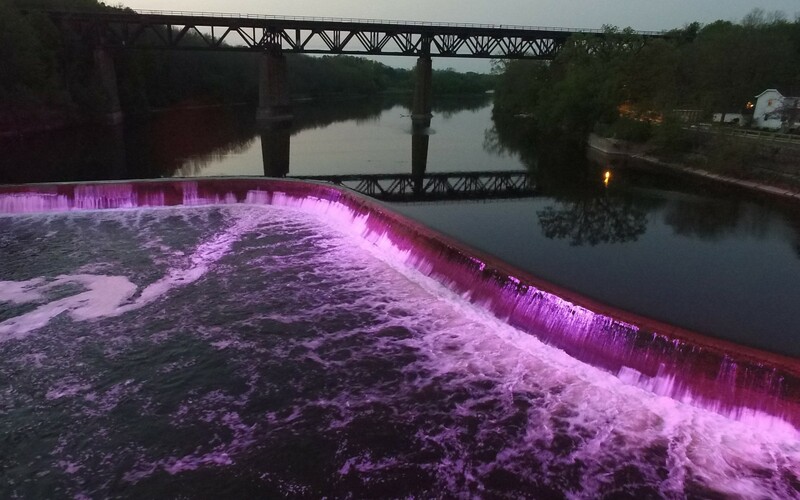 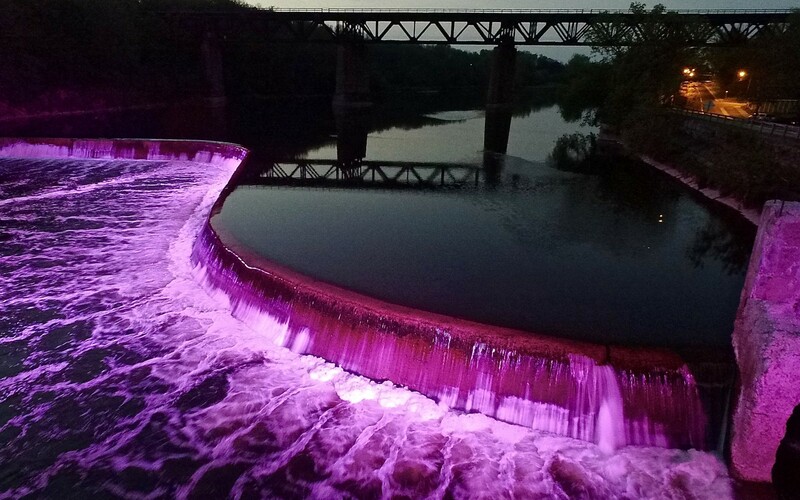 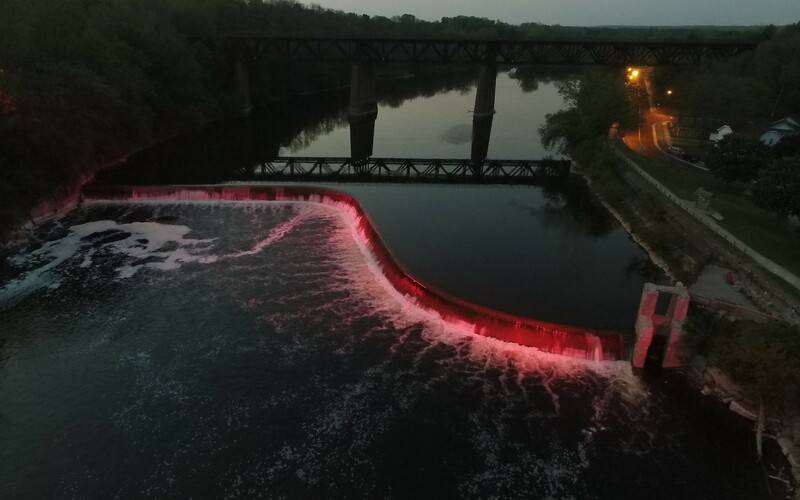 "The county was looking for a dynamic colour changing LED system that would bring the dam to life at night and peak the interests of locals and visitors alike to downtown shops and restaurants. 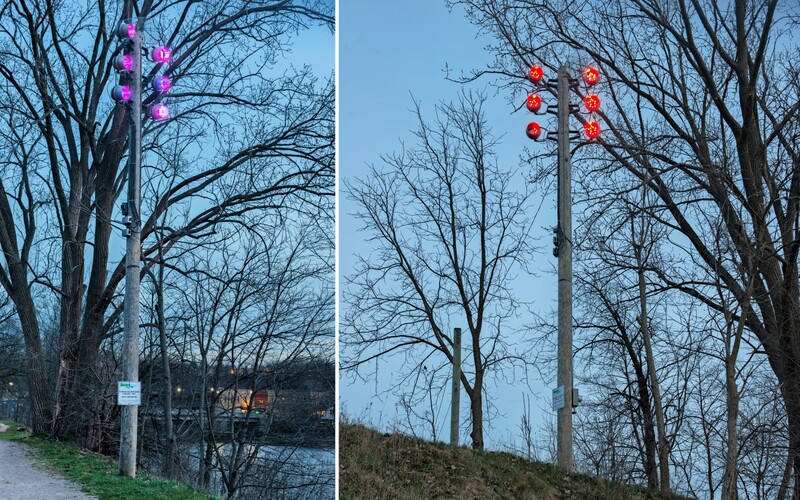 They also wanted to have the ability to highlight local events, such as holiday parades and festivals," says McIntosh. 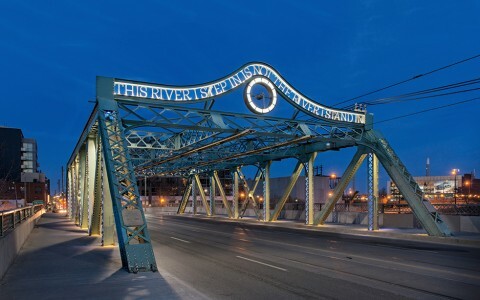 Mulvey & Banani Lighting chose RGBW Lumenbeam Grande luminaires. 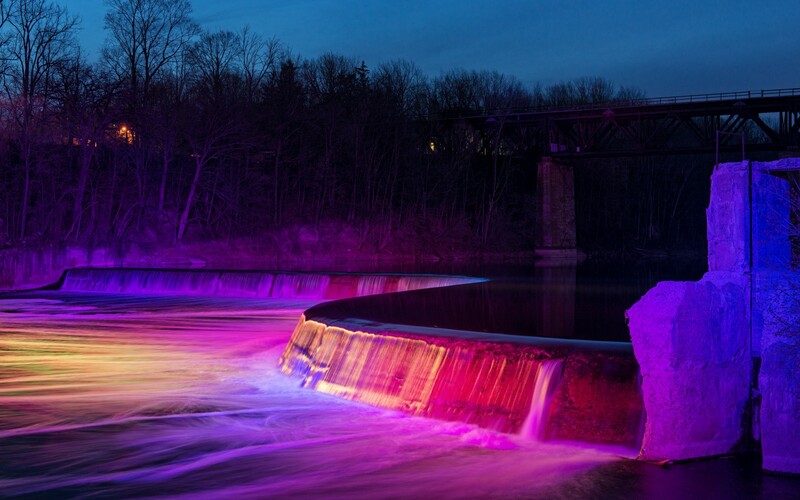 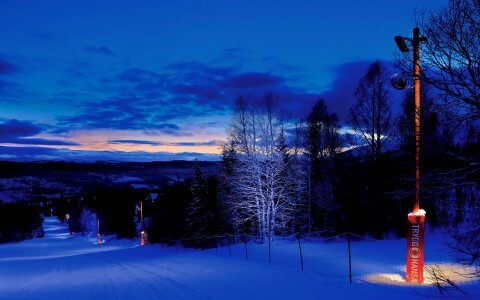 The luminaires use narrow beam optics and are mounted on two poles, one on each side of the river bank, with six luminaires per side, allowing light to be projected from as far away as 400 feet. 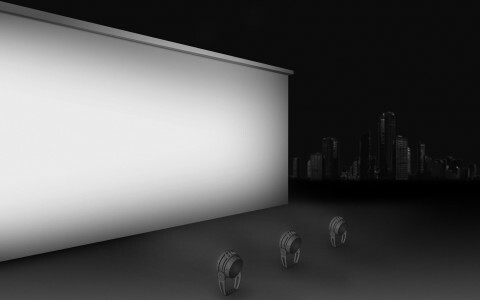 "Because light spill was a crucial consideration, 6 degrees optics were used and focused carefully to keep the light on its intended target while not trespassing into surrounding properties. 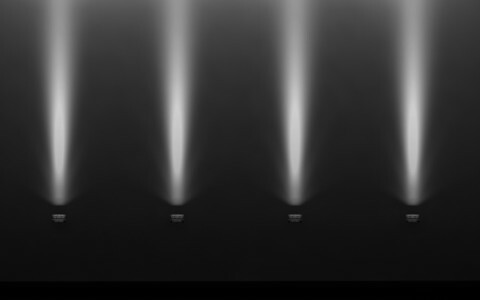 The use of full snoots furthered control over the beam," says McIntosh. 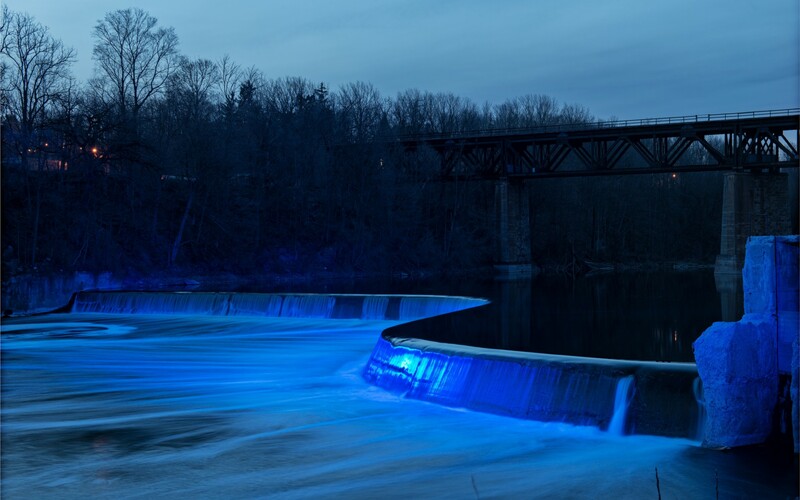 The design segments and enhances the dam's contours, making it visible from all angles. 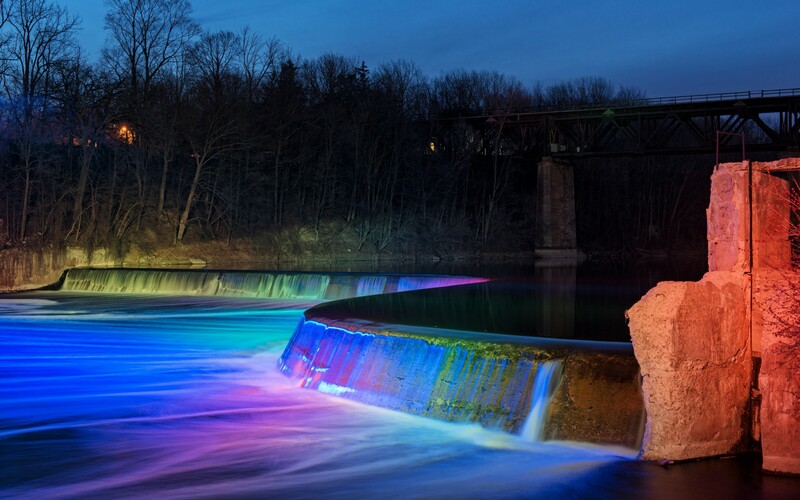 "It provides full control over each section and produces multiple design and control options for colour scrolls and chases allowing surface of the dam to dance," he says, adding that, "Dynamic effects and colour schemes are pre-programmed and triggered to change based on the system's internal clock." 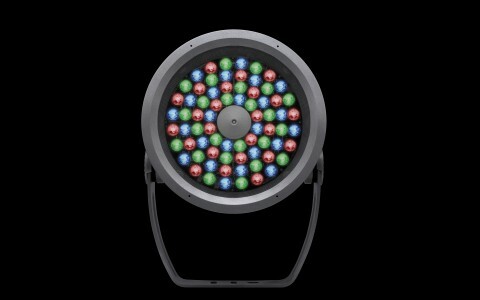 The new design has also significantly reduced energy consumption. 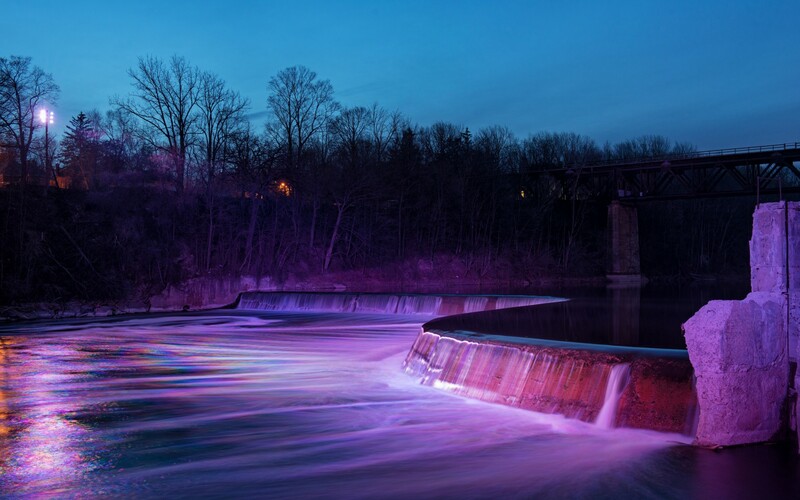 "The entire system consumes 1200W when all colours are at full intensity, which is less than one of the original flood lights," McIntosh says. 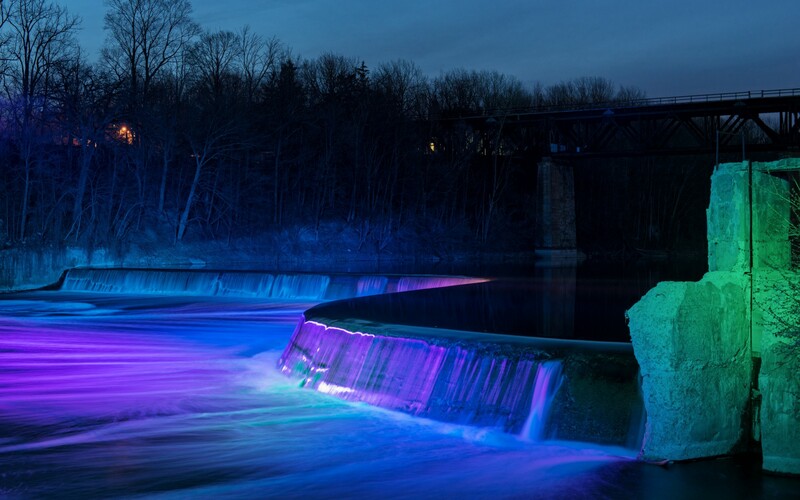 "The result is a dynamic lighting design that is visible from local bars and restaurants, adding a fresh face to an attraction that until now was only visible and photographed during the day," he says.